We have just completed the 2018 Indra Congress on Durban, South Africa. What a wonderful experience it has been. 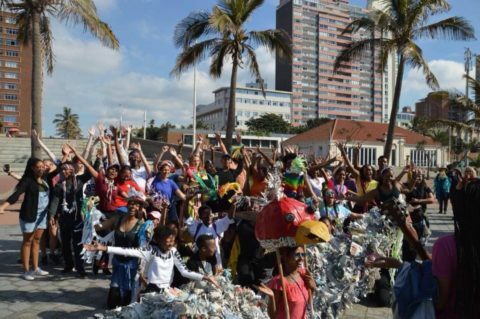 We are deeply grateful to Mary Lange and her dedicated team at ARROWSA, the University of KwaZulu-Natal, Durban University of Technology and Bechet High School for creating a dynamic framework and programme within which the talented, high energy participants could share stories, learn from each other and produce a vibrant carnival parade along the Durban sea front at the end of the week. Many thanks also to Friends of Indra who contributed to help make the week possible. Many thanks to them all! 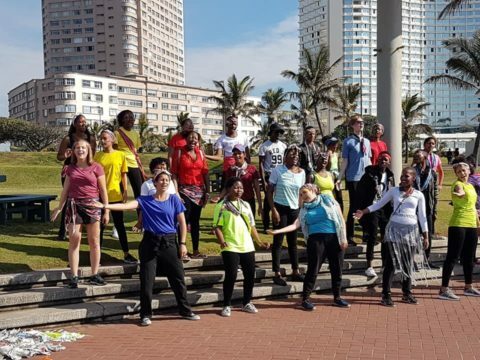 The dedicated South Roots International company from Cape Town shared with us their remarkable dance and theatre energy. Their work focusses on disadvantaged young people in fractured communities in the Western Cape and beyond, whose lives have been ravaged by drugs, poverty and violence. From Greece Betty Giannouli and her students gave us an intriguing glimmer of the spectrum of experiences in the lives of young people in that country. Through Skype they shared their film, a collage of haunting images and sequences, not easy to access but provoking real interest and debate. A young woman dances gracefully in the space, the music gradually changing to the overwhelming sound of helicopter gunships and gun fire. It is on the border between Gaza and Israel. The young woman continues to dance. The simple, symbolic performance from members of Al Harah Theatre in Palestine sparked off many discussions during the week. For many people in South Africa there is a resonance between their experience of apartheid and the treatment of the Palestinian people in Palestine and Israel. A hilarious and skillfully acted interpretation of the Little Red Riding Hood story from Plymouth UK raised important questions regarding predatory males, which despite the riotous laughter provoked a thoughtful discussion about how theatre can engage humour to explore urgent and shared social issues. Darryl and Lessle, together with 3 young people, had driven 2,000 miles from Namibia to be with us at the Congress. They have been involved in the establishment of an orphanage which had grown into a school, Anistemi.. From within the school has emerged an aspiration to become more engaged with cultural and artistic activities. Judging by their presentation, what was lacking in experience was compensated for by terrific enthusiasm and considerable natural skill. The young women from the study Hall Foundation in Lucknow India moved us with the recitation of poetry, written by themselves, which spoke powerfully about the prejudices faced by young Indian women and girls in their struggle for the right to education and not to be sold off into an early marriage. They finished their presentation with a delightful and colourful dance sequence. .The spirit of the Indra Congress, of performance, friendship and kindness has caught and bitten the Canadians who joined us this year. Abla Kacemi performed a powerful poem relaying her experience as a minority citizen in Canada. 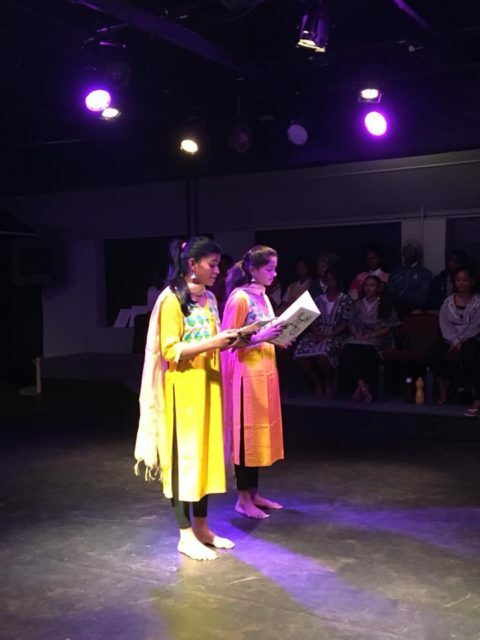 A group performance then reflected on the impacts of colonialism in Canada and how indigenous people were affected by the looting of the country’s resources by the European colonisers. Few of us would dispute the suggestion that the members of ARROWSA, led by the talented Bhekithemba Dlamini, were the very heart of this Congress. Their infectious warmth and vibrant energy enabled participants to feel truly welcome. 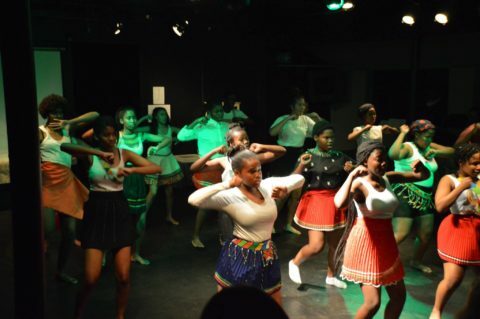 Their own performance provided a thoughtful survey of key historical moments in the struggle against apartheid, interspersed with passages of high octane dance and action. During the week the team of artists led training workshops in theatre, dance, music and street carnival. This all culminated in an explosion of life and vitality on the Saturday morning along the Durban sea front. The parade was skillfully structured by the organisers as the surging, colourful body of rhythm and energy, danced and sang from ‘station to station’, attracting significant gaze and interest on the way. The sheer physical energy, imagination and discipline was impressive. A memorable morning to round off a memorable week. Many thanks to Miranda Young – Jahangeer for organizing a series of presentations from Indra co-ordinators and other contributors that enables us to have an in-depth conversation relating to processes and practices underlying the Indra Congress. It is increasingly apparent that Indra’s practice must adapt to the changing world in which we find ourselves. During the week we were invited to go on a city walk with Doung of dala. Dala is an interdisciplinary, creative collective that believes in the transformative role of creativity in building safer and more livable cities. Doung is an architect and artist, and invited us to share his philosophy about the built environment, power and ‘the in between spaces.’ The walk did not involve the traditional tourist ‘sights’ but was a meditative wander around 21st century shopping malls, traditional African markets and tenement blocks. Much to chew on! This was an excellent Congress event which was made possible by the engagement, commitment and goodwill of many people and the big-hearted spirit of the participants. An outstanding feature of this Congress was the intensity of listening. Conversations sparked off by presentations and face to face meetings provoked a rich vein of dialogue and highlighted the important point that within Indra’s net there is no hierarchy of suffering: all the young people’s stories are important. Visiting South Africa for the first time is a major experience. Mandela became President of South Africa in 1994. A too common and naïve assumption from outside the country is that, following this momentous and deeply symbolic occasion, all would be well; apartheid was dead and buried. However, 24 years after this pivotal moment, too little has changed for the vast majority. The inequality is still there, the poverty, the slums, the violence. 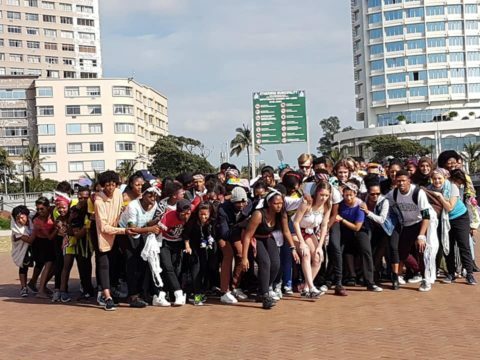 There is also the spirit of the ARROWSA young people at Bechet, for whom the spirit of ‘Ubuntu’, ‘I am who I am because of who we are’, what Desmond Tutu calls ‘the essence of being human’, is a burning, justice seeking reality: a creative and compassionate spirit that gives hope for the future.